10 Best WordPress LMS Plugins to Create and Sell Courses Online? #359 WP-Tonic Show: 10 Best WordPress LMS Plugins to Create and Sell Courses Online? Jonathon: Welcome back folks to the WP tonic show. It’s episode 359. I’ve got my great cohost with me, Cindy. Cindy would you like to quickly introduce yourself to the new listeners and viewers? Cindy: Absolutely. Hello everyone. It’s Cindy Nicholson here. I come from the coursewhisper.com. So I help people who want a little bit more help putting that course together. Jonathon: I just love the name Cindy. Always have, always loved it. Before we go into the main show, I want to talk about one of our great sponsors and that is WP Fusion. What is WP Fusion? Well it’s just freaking amazing. Basically it puts two of your leading elements in your technology stack. If you’re selling online courses or online entrepreneur. And that’s your WordPress with your CRM. And your CR is something like active campaign drip, mail chimp. And what it does is it really makes it easy for WordPress to talk to one of your CRM. And it works with about 40 plus of the leading CRM`s on the mob. I know you are amazed that there are 40 of them but there is. And it really puts it on steroids, especially if you’ve got a membership ecommerce website. I would go to the WP Fusion website. They’ve got a few videos, see how it works. You are going to be absolutely blown away. And you get amazing deal if you use this coupon code. And it’s wptonic, all one word. And if you use that you get 25% off any of the packages on the WP fusion website. And that’s exclusive to you viewers and listeners are offered nowhere else. So I’d go over have a look, but I would buy one of their packages and you also, you’ll be supporting the show as well. 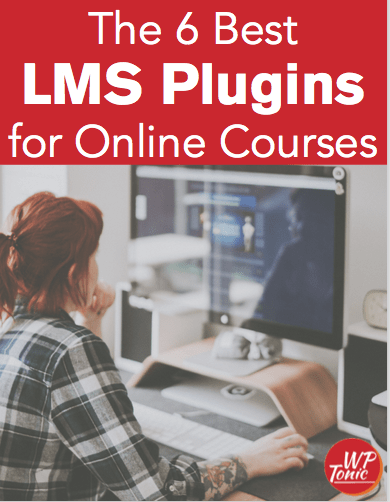 So Cindy we going to be looking at 10 of the best WordPress LMS plugins to create and sell your course online. Yes folks I wrote that tag line. It’s a bit long, isn’t it Cindy? Cindy: Well anytime I talk to potential clients or if I’m on podcasts or anything, I always get asked this question in terms of what’s the best plugin to use. So I think this is very timely and very relevant for our listeners Jonathan. Jonathon: Thank you Cindy. I got five stars for Cindy so that’s a great start to the day. That’s great. So we are going to dash into it. As we say. We are going to be listing off with my friends at Lifter LMS. I’m doing two things at once listeners. I just remembered, I’m putting the show notes for my beloved cohost into chat right now. Well attempting to. And its [03:41] inaudible] Oh God. Cindy: I have got the blog post here Jonathon. Jonathon: All right, great. So Lifter LMS and that’s Chris and Tom, the two founders. And the great thing about Lifter, it’s the basic program is free. That should be the diesel heading element of why you should utilize one of the plugins systems that we are going to be discussing today. It’s more about feature set, quality code, and quality of community. And are they going to be there in the medium to long term. are they going to keep updating this plug in? If you’re building more than one course on a platform and building your membership site, you really don’t want to have to jump ship halfway through. Because they’ve stopped developing, stopped supporting the plugin. That will be great would it Cindy? Cindy: Yes, especially if you’ve put all of that work in the putting it together, you don’t want to have to be jumping ship midterm or whatever. So you want something, a company that’s been established and that kind of has endured the test of time. For sure. Jonathon: A bit like me Cindy. Cindy: I wasn’t going to say that, Jonathan. Jonathon: I know you were thinking it though. I know the guys; they’ve been developing it quite extensively. They’ve got about a team between 17 to 20 people working for the company in there. I think they’re both pretty committed to Lifter. I don’t think either Chris or Tom are going anywhere in the near to medium future. They seem to be developing in it quite rapidly. They just issued. Fundamentally the core is free, but to actually gets it going, you going to have to take payments. And they offer a Stripe or a PayPal add on plugin or you can have both. You can take Stripe and PayPal. And they offer one of those at $99. So to get both, you got to pay a couple hundred bucks. If you want to take Stripe and PayPal So yeah, it’s free. You can build the course, but you going to probably want to take a payment. Soon as you want to take your payment, you’re going to have to get your credit card out. And they offer a number of other add on plugins. Some are written by themselves and some are written by third parties. So it`s a pretty good system. I’ve used it on a number of sites. By the way, there is no perfect learning management system. It really the depends on what you’re trying to do with the course. There are some scenarios where I wouldn’t recommend Lifter LMS. I’m not going to go into those reasons in this show because we got 10 plugins and I tend to waffle. So we’ve got to get on with things. Don`t we Cindy? Jonathon: So onto the next one, Learn Dash. Now Learn Dash is another great WordPress learning management plug in. I would say of the three, I’m going to discuss they are one of the top three. Some people would say they’re better plugin then Lifter. I would have said that about to be honest, even though I’m a friend of Chris, I would have said Learn Dash was probably richer, and more features and more established. I would say that about a year ago but Lifter LMS has moved on quite a lot. And I would say they are really competing head on now. LearnDash was developed before LifterLMS has a substantial customer base. Justine who’s been on the show, hopefully you will come back on the show in 2019 he is a great guy. Hi and his wife. And they got a great team at Learn Dash. I don’t think they’re going anywhere either. They keep refining the product. There are differences in philosophy about Learn Dash compared to Lifter LMS. How they approach functionality. It starts at $159.00 for a one site license. I used it; we’ve built websites for clients. It’s a great plugin. Any faults Cindy? Cindy: I don’t have as much experience with LearnDash as I do with Lifter LMS, but between the two as you say, I find that they’re quite comparable. It just made depend on some specific things. But there’s a lot of functionality that you’re able to get now with these plugins. So it’s very exciting from a course development standpoint. Jonathon: Is that they are moving quite rapidly. Both of them aren’t they with the functionality they are offering. Another one and they’ve been on the show last year and hopefully they will come back. It’s actually was developed before Learn Dash and Lifter LMS. It’s WP Courseware. I went back to their website and they’ve done it. When they came on the show last year, they said they were going to develop it out. And they kept their word. They really have .by the look of it this out quite substantially and I’m going to have to have another quite serious look at it. That to say, I think it started before both the previous plugins we have discussed. And with their new functionality, it’s something that you should look at. And a two site license starts at $129.00. Has WP Courseware been on your radar at all Cindy? Cindy: No I haven’t taken a look at in terms of your list here. I haven’t actually taken a look at a number of them. But it’s really kind of good check some of them out just to see if there’s different functionalities or what have you. But it’s good to get your advice to Jonathan just from the perspective of you’re the one that kind of probably get some quite intimate with these tools. Jonathon: I got to be truthful, there’s one coming up I’ve got some experience in. But the two that I’ve focused on is Lifter LMS and Learn Dash. I’ve got a lot more developers. They’re the two that we got members we’ve got developer licenses with. And they’re the two that we’ve concentrated on. I personally feel that both founders of both those plugins are not going to be going anywhere. I’m not surmising the people behind WP Courseware will go anywhere because they’d been well established for a number of years. And I think they’ve got a large user base. They were falling behind the feature set of Lifter and Learn Dash. But I like to say it looks like they’ve done a lot of work recently. And they’ve got a lot of functionalities. I will get back to you, listeners and viewers with a review of them. Now on to number four, how do you pronounce it? I always struggle here Cindy with this. Cindy: My assumption is Sensei. Jonathon: Sensei. Now Sensei I am going to be a little bit controversial here folks. Sensei is developed by Automatic. They bought it when they bought Woocommerce over three years ago. And it’s a learning management system that works with Woocommerce. And this all sounds fantastic don’t it listeners and viewers? The problem is that they’ve done bugger all with it for over 3 years. They’ve hardly developed it. Apart from security updates and some other updating. I don’t think they did anything to it for the past three years. And I heard through the grape vine is that they’ve got no plans to do much with it for the foreseeable future. Being that both Lifter LMS is actually just issued their 2.0 add on plugin that works with Woocommerce. So does Learn Dash. Learn Dash doesn`t have actual membership functionality built with it. It relies on add on`s that will integrate with the leading membership plugins. That might seem a bit to go against it a bit. But it doesn’t really because we normally recommend that you use MemberPress with LearnDash. And MemberPress is a really quality membership plugin that does really mature. And there is two to three other membership plugins that are fantastic as well. So it isn`t a problem. So that is the problem with Sensei. It’s also $129.00 for a one site license. And you also need Woocommerce, which is free. But there’s another plug in that allows you to do subscription. I think it’s called Subscription and you got to buy that. And that’s around $129.00 as well. I personally wouldn`t, I think cause we got Learn Dash and you’ve got Lifter LMS. It’s not something I would recommend. Do you agree? What do you think Cindy? Cindy: Yeah, I think based on what you said you want the enduring lifespan of the company. But you also want to see that the company making updates and changes and keeping current. So I think that’s part of the process when you decide which plugin to use. So it’s good to know that about Sensei. Jonathon: Yeah probably my luck tomorrow they bring out a new version actually Cindy. It would just be my luck. On to the next one before we go to our break. And that`s Learn Press. And I got to be truthful before, until this article and a bit of research I know nothing about Learn Press. They’re a company that does a number of themes and plugins aimed at the learning entrepreneur. The actual plugin, it seems reasonable to me. It’s free, but with a parasol. It’s really integrates with the themes that they make. They use Theme Forest as their main distribution channel. Which some people in the WordPress community would kind of turn their nose up on. But it’s a great way for a small to medium site developer to sell their product. And also get it known. it’s not exactly free. the themes you get through Theme Forest and they start around $69.00. Their themes really integrate well with their own learning management system plugin. I have no experience on how their learning management plugin integrates with other themes. Cause I haven’t used it folks. I’m not going to lie to you. The only thing is sales wise. I think how big a company it is. But then I saw on Theme Forest, one of their most popular themes, they had sold over 16,000 of these themes Cindy. 16,000. The other thing is they seem to update their themes on Theme Forest. The last update on this particular theme they did on the 21st of December. So you got to keep that in mind folks, that some of these. Like I said are they going to be keeping the learning management system? This particular company seems to be reasonably profitable. They’re based in Vietnam, which you shouldn’t go against them. I’m just pointing it out to you, but financially with those kind of theme sales they would probably look like they’re pretty financially stable. But keep in mind you probably going to see that you get 30 days if you’re not buying one of their themes. And also it’s not one of the well-known of these learning management systems. So if you come to us or some other developer that specializes in the building of learning management systems and membership sites. They’re probably not going to have a lot of experience with it. Jonathon: We’re going to go for our break folks. And when we come back, we’re going to delve some more in this world of learning management systems, WordPress and plugins. We will be back in a few moments’ folks. Announcer: Do you want to spend more time making money online? Then use WP Tonic as your trusted WordPress developer partner. They will keep your WordPress website secure and up-to-date so you can concentrate on the things that make you money. Examples of WP Tonic client services are, landing pages, page layouts, widgets, updates and modifications. WP Tonic is well known and trusted in the WordPress community. They stand behind their work with full, no questions asked. 30 day money back guarantee. So don’t delay. Sign up with WP Tonic today. That wp-tonic.com. Just like the podcast. Jonathon: We are coming back. Hopefully I have not bored the tears of Cindy. Cindy: No, Jonathan, this is all good stuff. Cause it’s so important. Because this is one of those decisions you want to get right from the beginning. Because it’s not something that you want to backtrack on or change course on. So it’s good to do the research and the rigor around it before you get started. So your insight is really valuable. I find Jonathan as we go through this. Jonathon: On to number six. Course Press Pro and this is from WP U Dev. Now I am going to be slightly controversial here as well. The MP Dev people I’ve had no falling out with any personal problems with them. They have been in the word press ecosystem for many years. They started early when WordPress was ramping up to become the juggernaut which it is now. the problem is they sell a number of plugins. It`s a membership site to buy plugins with which they exclusively develop or they had third party developers. But those third party developers, you can only buy their plug in`s through their website. And it’s a membership site. So you pay $49.00 a month. And you have access to a catalog of plugins. The problem with this is I found like a lot of their plugins apart from their top three or four are okay. But I’ve always found that they’re not top of supper breeds. They don’t update them that often apart from their top library. And they are just okay. But they’re not the top of products. They’re not somewhere I go to. They built a niche by building plugins for WordPress Multisite. Do you know what Multisite is Cindy? Cindy: You got me Jonathon. Jonathon: I’m going to tell you right now Cindy. A multi-site it enables. It’s what wordpress.com is built on the core technology. And you can download multi-site. It’s WordPress on steroids. It enables you to set up a network of websites and only have one administrative area to administrate 10, 50, a hundred websites in one administrative interface. That’s the key thing about multi-site. It was a bit of a nightmare until it’s not the easiest thing to set up. Now I haven’t done it for a while. I’ll get my developers to do it when we doing one of those. There it is, that’s my crux. I haven’t used their membership pub. Their learning management plugs in anger. It’s called Course Press Pro. My general reservations are the company in general really. Did that make sense Cindy? Cindy: It made complete sense Jonathon. Thank you. Jonathon: Onto the next. Ultimate Learning Pro, which you can get it on Code Canyon, which is a sub website of Theme Forest. You cough out $39.00. I am going to be a little bit controversial here as well to be honest about it. They updated it on January the fourth which is a good sign. They sold about 400 of these since it’s been on Code Canyon. I didn’t look at what other themes or other plugins they sell. But hopefully they have got others because how long can they keep on supporting this effectively. When they have only sold 400, that’s my concern. And I’ve been in the early days when I was implementer, when I was doing local websites. I used to buy a theme and then go back to it. Once it’s support enough and then after six months they would disappear off Theme Forest. You got to be a little bit cautious. But its $39.00. I’ve got no, I haven’t used it in anger. I can’t say much about it. It looked interesting, go and has a look at it. But keep your eyes open and understand what you’re buying into. Cindy: That`s a bit of a flag there Jonathon I would agree. Jonathon: Onto the next one number 8. Master. Study LMS. It’s free, but it isn’t free. Because well how can you sustain a business by being free? You can give. It’s a bit like why I do the podcast, why I write these articles. Is I’m doing it for free as a way of helping the community but also to advertise my services. And that’s why you do things you do as well, Cindy. So there is nothing wrong, but you probably can use it with other themes, but they recommend that I use it with one of their themes. And their themes you get off Theme Forest and they start around $69.00. It seems a quite a substantial company. They updated the actual plugging six days ago, which is a good sign. They got a snazzy video on the wordpress.org depository where you can download the free plugin. And they do, and they say it’s designed to work in hand with our theme. They are not misleading. They’ve got a demo of the actual website using their plugin. It’s got to be truthful. I wasn’t that impressed with the demo. But I only had a quick look over it. But I thought I put it into my article because it’s something I don’t know. And it could be something of interest to you. But be aware that for a less stressful existence, that if you do buy the plug in, you’d be better off buying one of their themes. Because then you get their full support. And if there’s any kind of plugging conflicts or anything, they’re going to help you sort it out. Or they should. Onto the next one. Good LMS. It`s on Code Canyon again. Sold about 300 to 400 in total. I don’t know what other themes and plugins that goes on the Code Canyon or Theme Forest market place. It hasn’t been updated since March 2018. That’s a red flag. Cindy: Yes I would say. Jonathon: I’m trying to educate the listeners and the viewers about another little tip listeners and viewers. If you buy something off a developer of Code Canyon or Theme Forest. And you haven’t done business with them before; always send them a sales question. Think UP a question. They’re going to love me for saying this, but think of a question and send it to them. Now if you don’t get any reply or B, it’s like two weeks later. If they can’t reply to your sales message question promptly. How well do you think they’re going to do with your support question? Cindy: That is so true. Especially when it’s sales. Do you think they’d be motivated to get back to you? So if they don’t get back to you after that, then what are they going to do when you actually have a problem with their tools. So that’s a good piece of advice Jonathan. I don’t think I’ve ever done that before. Jonathon: Yeah I have learnt the hard way. If they can`t be bothered to your sales question. Its bit of a red flag with how they are going to do with your support question, isn’t it? It’s a terrible world folks, it’s an immoral world. I’ve seen the little bit, but when I look at other people I think I am a rato. But when I look at other people’s activities, sometimes I think I am saint. You can’t always go by the number reviews and the five star reviews folks. Because they do have mythologies and methods of semi artificial five star reviews. Put it that way. But that was a red flag. The last one, how do you pronounce it Cindy? Jonathon: Namaste. It seems interesting in a way and I know nothing about the company. But when I was doing the research they came up. They seem to have quite a few people using it. It’s free. It’s another set up where it’s free, but you really got to go to the pro version to get a lot of the functionality that you’re probably interested in. It was updated two hours ago. Because I checked it this morning. But if you want, they do free pro versions. It starts at $47.00 but you don’t get much at $47.00. You’re better off going for the medium, which is $87.00. It’s one of those that I might look into a little bit more. I was a little bit intrigued by it. I don’t know where they are based, I don`t know who they are. Another factor is going to their website folks. And if they haven’t got an about us page or tell you something about the founder who owns the company. I always get slightly concerned Cindy. I like to learn who the founder, where they are based at was. and do they provide a physical address on the website. I like to see those things. What are your thoughts about that Cindy? Cindy: I agree 100%. It’s funny, I hear about this a lot is the about page is one of the most visited pages on a website. And if you can’t find the people behind the business, I agree it kind of makes you a little bit uncomfortable. As to whom the heck is putting that together for you. So I agree. Jonathon: So the three companies that we talked about, Lifter LMS, Learn Press and Course Press Pro. Is really easy to find out who is on their websites. So you founded who they are, how to contact them. It’s reasonably easy to find out more about these people. The three that I’ve started off this review with. It seems to get harder and harder to find any information about the people. And I’m not making any; you do get in the developer community that they don’t like to publicize themselves to some extent. I do think you’re in a commercial business. You got to understand that is probably best. So hopefully folks that review have being useful. There’ll be a link to the full show notes. There’ll be a link to the full post that I did on all these plugins. Cindy how can people find out more about you and what you’re up to? Jonathon: That`s great. And if you want to find more about our services and our build outs and our plugins and our support. And also we do a turnkey solution where we help you get set up on WordPress. If you’ve been with one of those fully SAS products and you want to come back to the lights of WordPress. We can help you there as well. If you really want to support the show, folks, give us a review on iTunes. It really does help the show. And we’ll see you next week where we will have a guest or we’re have another internal discussion where we hopefully offer you some great insights and value. We see you next week folks. 7 – #Ultimate Learning Pro $39!